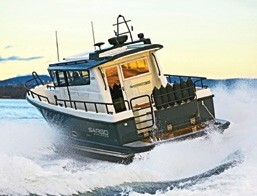 Family-run boatbuilding company Sarins Båtar Oy Ab, headquartered in Kokkola, Finland, has changed the name of their rugged boats from Minor Offshore to SARGO. “The core of our brand has always stood for an all-season boat made in Finland for serious boaters, whether professional or pleasure – a sport utility boat that is made to last, to provide excellent performance characteristics even in demanding conditions, and to give true value for the money,” said CEO Thomas Sarin, the son of legendary boatbuilder Edy Sarin who started the company in 1967. Known for their solidity, smooth ride and safety in rough water, every SARGO model from 25 to 36 feet is built to international B-Offshore certification. Many Minor/ SARGO boats have been exported to professional customers including police and rescue authorities that need heavy-duty vessels throughout the year. The full SARGO range is available at Skarne Marine LLC in Milford, CT. “We are the exclusive North American importer of SARGO boats,” said company president Carl Skarne. “These boats are built in Finland to the highest of standards, and we believe these versatile yachts will change the way you boat.” For more information, visit skarnemarine.com.